The VFA's strongest clubs broke-away in late-1896 to form the rival Victorian Football League (VFL) which quickly established itself as the dominant football body in the colony and assumed the role of Victoria's official representative team. The Association briefly returned to the representative spotlight in 1905, playing a series of annual matches against the South Australian Football Association (SAFA) after the South Australians had fallen out with the VFL over the sharing of gate revenue. Plans to continue the series beyond 1911 were scuttled when the Australasian Football Council (AFC) pressured the SAFA to terminate the arrangement and only play against AFC-affiliated opponents. The SAFA eventually buckled, resuming matches against the VFL in 1912 and leaving the VFA on the outer once more. Other than 1931-37 when a period of détente saw regular matches against the VFL and an AFC-approved match against New South Wales, the VFA remained frozen out of top level representative football until late-1949. The most unusual match of the era occurred in September 1916 when a VFA combined team played North Melbourne at the Arden Street Oval - the only game played that year. See the notes below the table for more information. NOTE: matches below shaded in dark grey were practice/exhibition matches and are not considered official representative contests. 1898 vs Ballarat FA - this match appeared in the original season fixture but was cancelled. The VFA chose to play their postponed premiership matches from the May 24 King's Birthday holiday instead. 1900 vs Footscray - a fundraiser for the family of the late Frank Mitchell, played between the VFA premiers and the rest of the Association. Mitchell was a long-serving secretary of North Melbourne FC and life member of the VFA who had helped keep the Association going when the strongest clubs broke away to form the VFL and he had been "principally responsible for Brunswick, West Melbourne and Prahran joining the ranks". [(Footscray) Independent 25-8-1900, p.3] Robertson (Brunswick), McKinley (Williamstown) and Brown (Prahran) played for Footscray who were without four of their premiership team. 1901 - a further request to the VFL for a representative match was rejected leaving the Association with no opponents while the VFL played interstate football against South Australia and representative matches against the Ballarat FA. 1902 vs VFL - fundraiser for Fred McGinis who had been a star player for Melbourne in the VFA and early VFL before losing his sight due to illness. The match was played on a Thursday for the Show Day holiday. 1904 - a dispute between the VFL and the South Australian Football Association (SAFA) over gate takings saw the South Australians call an end to interstate matches between the two bodies. The VFA seized on this opportunity, initiating annual matches against the SAFA. Note that although these contests were described as "interstate" and "Victoria versus South Australia" - especially in the Adelaide press - they are not categorised as interstate matches in the above table because the VFL was the state's major league in 1905 and was Victoria's only affiliated league with the game's national governing body, the Australasian Football Council (AFC/ANFC) from 1906 onwards. 1905 (June 24) vs South Australia - the first match played in defiance of the VFL. Both teams wore numbers, and scorecards listing the players and their numbers were printed. The VFL vs Ballarat FA match was played the same day at the nearby MCG. 1905 vs Stawell FC - played on the way home from Adelaide. Stawell had 21 players in the first half, 19 in the second half. 1906 vs Stawell FC - played en-route to Adelaide. Stawell had 21 players throughout, the VFA had 18. 1906 (Aug.11) vs South Australia - VFL teams originally had the day off while the League XVIII played in Ballarat. The VFL rescheduled two matches from the previous week - including the top of the table Carlton vs Fitzroy match - in order to clash with the VFA's match against SA. It had the desired effect with the VFA crowd reported as "only moderate" whilst an estimated 25,000 fans watched Carlton take on Fitzroy. The VFL's actions destroyed what had been a relatively amiable relationship between the two football bodies and the VFA responded by banning their clubs from playing any future matches against VFL teams. 1906 (Aug.29) vs Bendigo & Northern District FAs - played midweek with barely a mention in the Melbourne press. The Bendigo Advertiser notes this was the Association's first visit to Bendigo. The reason for the VFA's visit remains unknown but it was likely due to a local public holiday (the VFL's representative team occasionally played midweek in Bendigo for the same reason). The VFA team was far from a full-strength line-up, with only 7 of the players from the South Australia match a fortnight earlier being selected (and two of those were late withdrawals). The lack of big names was probably due to the match being played in the middle of the working week. 1907 vs Stawell FC - played en-route to Adelaide. Stawell had 20 players throughout. 1908 - no visit to Stawell due to the addition of matches at Broken Hill. 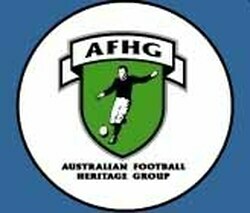 1909 - matches against Barrier Ranges FA were cancelled due to an economic recession in Broken Hill. 1910 - the AFC formally banned their member leagues, associations and clubs from playing non-affiliated bodies such as the VFA. 1911 - final match of the deal between the VFA and SAFL. A new 5 year contract was signed but later terminated due to pressure from the AFC who only wanted the SAFL to play against affiliated leagues such as the VFL. 1913 vs Western District FA - the VFA attempted to organise matches with local leagues at Warrnambool (July 19) and Colac (July 23). The Argus (10-6-1913, p.4) reported that these matches did not eventuate, however, it was only the Colac game that fell through. VFA premiership matches were played the same day back in Melbourne so selectors chose two players from each club. Tom Clarke (Essendon A) kicked a then VFA representative record 10 goals. 1916 vs North Melbourne FC - due to the First World War the VFA ended their 1915 season early and went into recess during 1916-17. However, the players re-united for this one-off match: a fundraiser for former South Melbourne and North Melbourne player Harry Todd who lost his hands in a workplace accident. North Melbourne fielded their 1915 premiership team and players on both sides were reported to be out of form having had no football for a year. The following week a fundraiser was also played between retired North Melbourne and South Melbourne champions with South winning 4.4 (28) to 1.0 (6). 1920 vs Goldfields FA - the VFA became the first top-level Victorian league or association to send a representative team to Western Australia (the VFL would send their first representative side the following year for the National Championships held in Perth). As with the 1913 match versus Western District, two players from each VFA club were chosen for the tour. 1924 vs Perth FC - played in defiance of the AFC who did not want a WAFL club playing a non-affiliated league or club. Despite threats of heavy sanctions, the match went ahead and was played in heavy rain and strong winds. 1926 vs Central Gippsland FA - charity fundraiser for the West Gippsland hospital played the week after the VFA Grand Final. 1927 vs Central Gippsland FA - played on the Show Day holiday in front of a small crowd; the VFL Reserves 2nd semi final between Carlton and Collingwood was played at the same time on the MCG, drawing a larger crowd of 8,500. The venue was known at the time of this match as the Motordrome (it was renamed Olympic Park in 1933). The first half was even and the VFA held a 2 point lead at half-time. The second half was a massacre as the VFA scored 71 points to just 4 by the CGFA. 1931 vs VFL - the VFA and VFL brought an end to their hostilities, signing a permit agreement that cleared the way for player transfers between both organisations. After years of acrimony the League also agreed to play the Association with the proceeds going to charity. 1931 vs New South Wales - The VFL had been playing regular interstate matches against New South Wales since 1920 but were unable to send a team to Sydney in 1931. The NSW league approached the VFA to take the VFL's place but this required ANFC approval because the VFA was not an affiliated competition. 1932 - The Argus mentions a possible match against NSW in Sydney in August but it did not proceed because the VFA posted a loss from the 1931 trip and the VFL had resumed their annual contests against the NSW team. On the King's Birthday holiday the VFA confronted the VFL at Princes Park and were unlucky to lose a hard-fought match by 8 points. 1934 vs VFL 2nd XVIII - the VFL's 1st XVIII played South Australia in Adelaide the same day. 1935 vs Richmond - on March 30th Richmond and South Melbourne played a Grand Final re-match under lights at Olympic Park; this was the first night football match in Victoria since 1879. Although it was only a pre-season practice match the game drew a crowd of 25,000 eager fans and Richmond were keen to test the market further. A night match against Collingwood was proposed for the following Saturday but needed VFL approval to proceed. After much discussion about the merits of night football, the League announced on the eve of the match that it refused to permit the game. An alternative proposal was then put to the League for Richmond to play a VFA representative side under lights on April 13th. Again, much debate ensued but this time the League reluctantly granted its approval and the Association selected a representative team to be led by Preston's Danny Warr. On the day of the match Melbourne was lashed by gale force winds, forcing a late postponement. The match was rescheduled to the night of Tuesday the 16th but torrential rains forced another postponement. The VFA proposed the match be held on Wednesday the 24th but this date was rejected by Richmond because it was only three days before their first premiership game of the season. Richmond suggested Tuesday the 30th might be possible but this was never followed-up officially and with the opening round of the VFA and VFL seasons fast approaching the night match quietly disappeared from the schedule. 1936 (June 29) vs VFL - played on the King's Birthday holiday. 1936 (Sept.24) vs VFL - Prince Henry's Hospital fundraiser played under lights on the Show Day holiday. Neither team was full-strength due to the match being played during the VFA/VFL finals series. 1937 vs VFL - played on the Coronation Day holiday. At the end of the season the VFA proceeded with plans to alter their rules to make the Association game more popular, including reducing the number of players on-field from 18 to 16 per team and introducing a throw pass. These changes ended their permit agreements with the VFL and created conflict with the ANFC; forcing an end to the Association's presence on the representative scene. 1945 - Coburg and Williamstown toured Broken Hill in October, playing each other on Oct.20 with Ron Todd kicking 6 goals for Williamstown. The following day a Combined Coburg-Williamstown team defeated the local league with Todd kicking 10 of the combined team's 14 goals (including 8.2 of 8.3 in the first quarter). The local press refers to the Combined Coburg-Williamstown team as a VFA representative team but this was not correct. Thus, the match has not been included in the above table. 1947 vs Bendigo FA - an exhibition match held to increase regional interest in the VFA, played on a Monday public holiday. Four VFA players took the field for the opposition: Egan and Brokenshire (Sandringham), Jack Blackman (Preston captain-coach) and Laurie Taylor (Camberwell). Egan was the BFA's best player and Brokenshire kicked 10 goals for the locals.